I raced my first 5k over the weekend. Camille, my awesome amazing and to be much thanked running buddy, and I have been training both separately and apart. 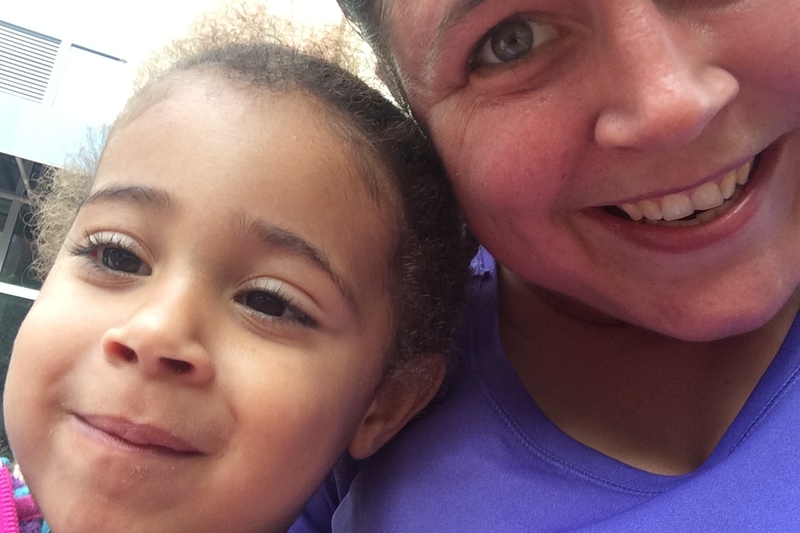 She, to get back to running after a few kids, and me, to get to a point where I wouldn’t embarrass myself by collapsing on the course after the first mile. We both succeeded, and I made it through the entire 5k while pushing a toddler (UP GODDAMNED HILLS) in a stroller. 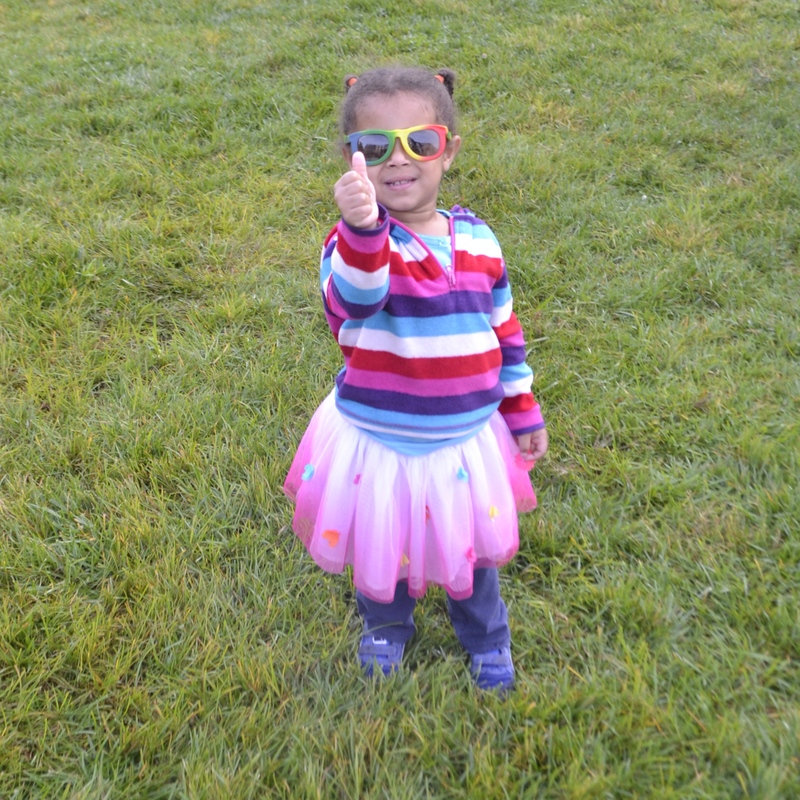 Jasmine giving me a thumbs up for the sunglasses she got before the race. 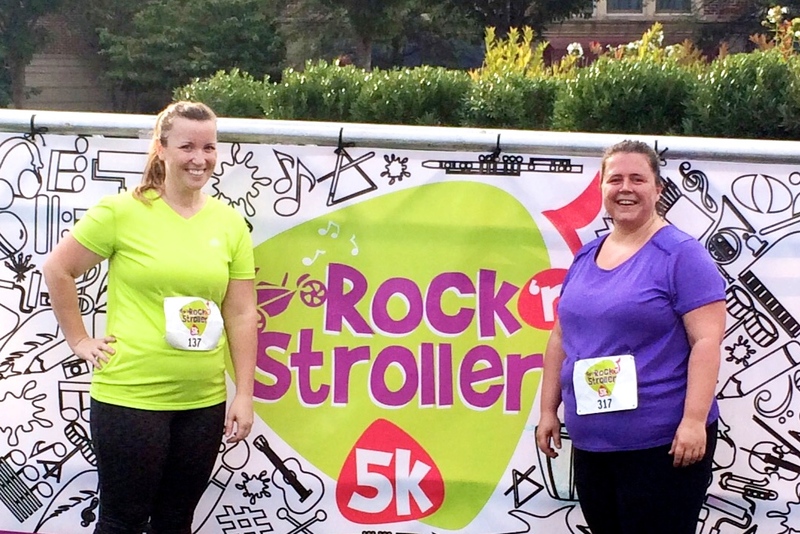 The Rockin’ Stroller 5k was designed with families in mind. 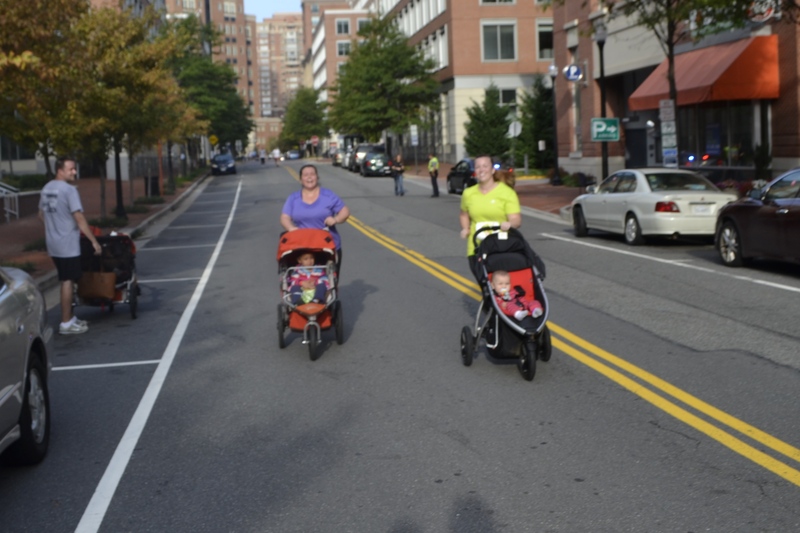 Everyone in the race was pushing a stroller (although some kids were ornery enough to want to walk or run the entire race THOSE FOOLS). 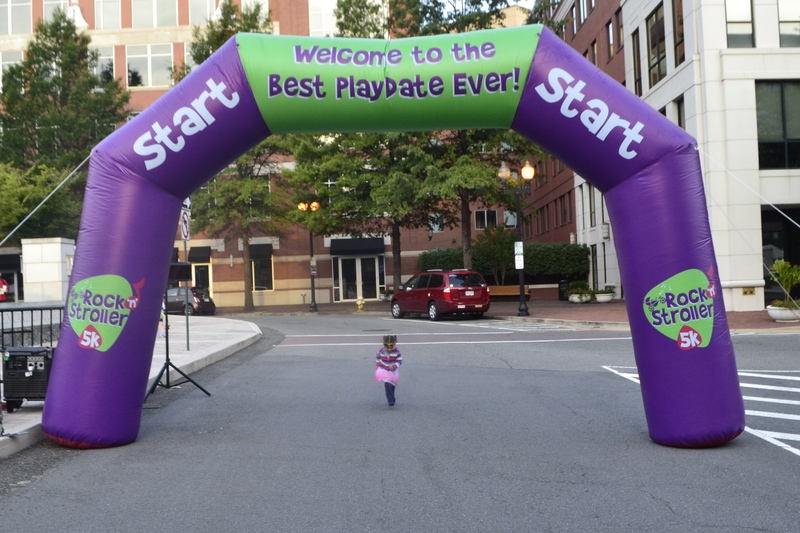 My toddler, no fool is she, sat in comfort as I pushed here 5k up and down Eisenhower Avenue in Alexandria. Jasmine crossing the finish line … before the race even started. I had to slow to a walk a few times, but I’m pretty pleased with having made it to the finish line without puking, collapsing, or dying. Four months ago, I couldn’t even run 200m without stopping to walk, so 5k with a few short breaks sounds reasonable to me. Last of the runners, but ahead of the walkers. Note: I only selected one shot of my hilariously bouncing breats here, but in the series Bertrand took, you can see them bouncing from side to side as you flip through the slideshow. Which I will not show on this blog. Because, while it IS hilarious, I do still like to pretend that I have some dignity left. Best fake smile ever. 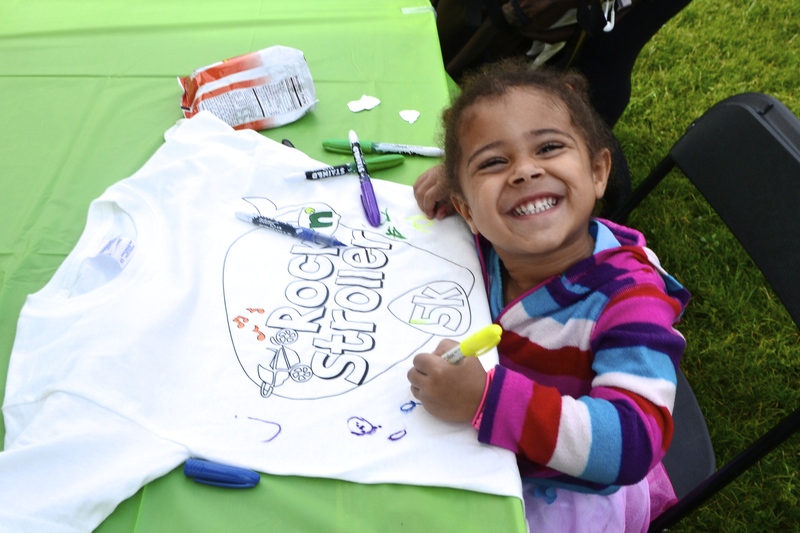 Coloring in her race t-shirt! LOLOLOLOLOL…that’s why I wear two bras. You rock! I am so happy for you and inspired by you! Well done :-). Congrats! That is a major accomplishment! Next Post Language test or bust – back in a flash!